32 kilometres south from Amman along the King’s Highway is the mosaic-filled city of Madaba. 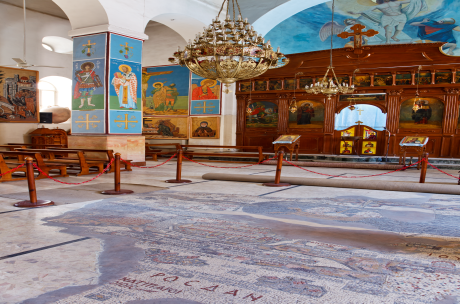 Its chief attraction is a wonderfully vivid Byzantine mosaic map of Palestine, showing Jerusalem and other holy sites, decorating the floor of the contemporary Greek Orthodox Church of St. George. Made with two million pieces of coloured stones, this mosaic is definitely a masterpiece, but countless other mosaics that date from the 5th till the 7th centuries are scattered throughout the churches and houses of Madaba. It is also worth visiting the Madaba Museum situated in a traditional residential quarter. The museum exhibits the early history of Madaba including Bronze Ages, Roman/Byzantine periods including some well known mosaic floors.